It’s basically every water slider’s worst nightmare. You don’t want to fall off. But you couldn’t fall off, right? 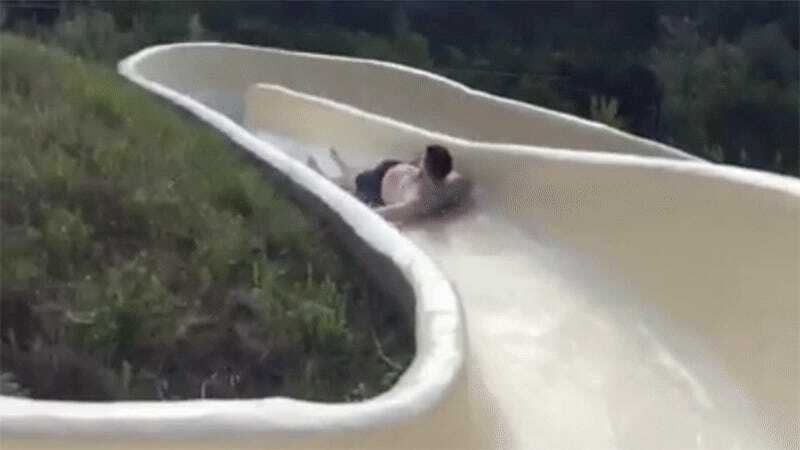 The people who design waterslides wouldn’t let that happen. Right? Well, one guy from Dallas learned the hard way that you can’t trust anybody these days. Especially waterslide designers. David Salmon posted this video to Facebook, which purportedly shows him on private property outside Austin, Texas. The video is absolutely terrifying. Especially when you know that on the other side of that waterslide lip is a very steep and rocky cliff. Mr. Salmon was transported to a hospital in nearby Round Rock, Texas, but luckily he only suffered broken bones and won’t require surgery. His hashtag to the video, #notdead, says it all. Stay safe out there, kids. And maybe exercise caution when you’re on waterslides. Especially if they’re on private property in Texas. I’m going to go out on a limb and say that this isn’t something that’s inspected by the state theme park authorities or anything like that.